← Austin Then & Now – with a Mystery! Visions of sugarplums…and writing and love! Now that Thanksgiving has come and gone, I (very) grudgingly defer to the holiday season. As anyone who knows me can attest, I don’t do holidays well. But it’s that time of year again, like it or not. And while I refuse to acknowledge HallThanksMas, now that the turkey is nothing but leftovers, I give in. And in the spirit of the season: sweets and gifts! Through a happy coincidence, while in the midst of the frenetic chaos that was the book launch for FORTY & OUT, I stumbled upon an anthology call from author Lois Winston. She proposed a collection of dessert recipes combined with advice on love and writing tips from authors of all genre. I sent off a treasured family cookie recipe and what wise words (too many, I realized later) I could muster on love and writing. Lo and behold, Lois collected recipes from 105 authors, mostly of romance and mystery, and created a fantastic collection called BAKE, LOVE, WRITE. She designed the cover, handled the formatting and submission to Amazon, etc., and we have a beautifully finished product to share in both print and ebook format. With 105 enthusiastic writers behind this book launch, the publicity push has been phenomenal. There’s a Pinterest…something – board? (never figured out that site) and a video, a Facebook page, a Goodreads giveaway (which ends Friday, December 5th – don’t miss out! ), and a Twitter hashtag (#BLW). Some of the authors including Helena Fairfax and Kathleen Kaska have set up a blog tour of sorts, interviewing various contributors over the weeks and months since the release. I’m scheduled to be featured at Stacy Juba’s blog on December 7th. Why should you care? 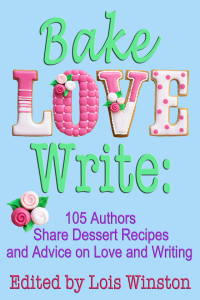 Because this is a great collection: 105 dessert recipes of all types, cute/funny/heartwarming tales of love, and noteworthy tips for all of us who put words on the page. How can you lose? Don’t tell my family, but guess what’s on my meager solstice shopping list? This entry was posted in Uncategorized and tagged #BLW, advice, baking, desserts, holidays, writing. Bookmark the permalink. 10 Responses to Visions of sugarplums…and writing and love! My copy of Bake, Love, Write is already showing some wear. It hasn’t even found a place on my bookshelf yet. Right now it’s in my kitchen and is being used regularly. 2) I knew we had a ton in common already, but I am so happy to find someone else who doesn’t “do” the holidays. 3) May your sugarplums all taste dandy! Happy holidays for you, whatever they are in your life. It seems like the holidays are harder for me each year. This year is really hard. I have my own copy of Love Bake and Write and love the many recipes. What a great idea Lois had! Isn’t it though? So thrilled to be a part of it. It has been a joyful roller coaster ride!